Real-time x-ray imaging is done in transmission and the image can be captured using film or an x-ray imaging system. The sample may be rotated to allow various perspectives, within the limitations of the sample size and geometry. 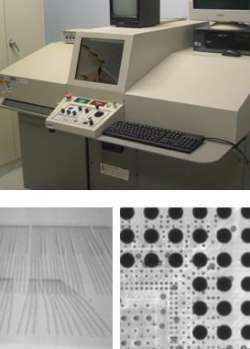 X-ray imaging is a quick, non-destructive analysis technique to look at solder joint quality and the large scale structure of devices. If defects are detected, recommendations are made for further tests or analyses. Voids in through hole pins.